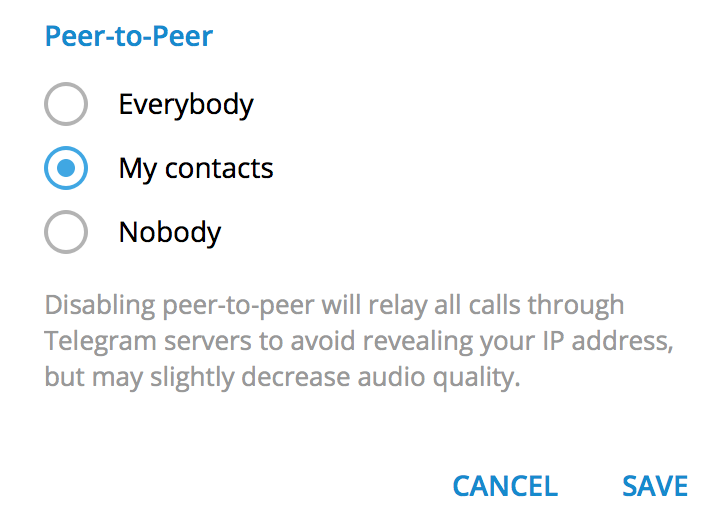 Telegram is supposedly a secure messaging application, but it forces clients to only use P2P connection while initiating a call, however this setting can also be changed from "Settings > Privacy and security > Calls > peer-to-peer" to other available options. 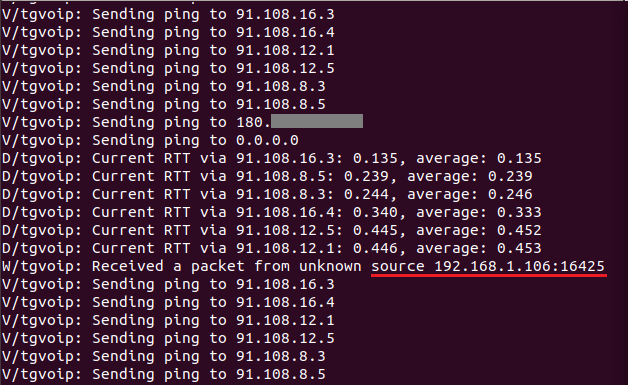 The tdesktop and telegram for windows breaks this trust by leaking public/private IP address of end user and there was no such option available yet for setting "P2P > nobody" in tdesktop and telegram for windows. 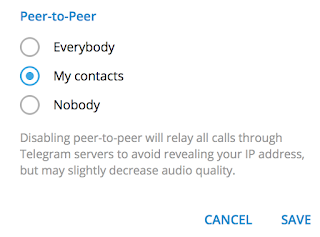 PS: Even telegram for android will also leak your IP address if you have not set "Settings > Privacy and security > Calls > peer-to-peer > nobody" (But Peer-to-Peer settings for call option already exists in telegram for android). 4. 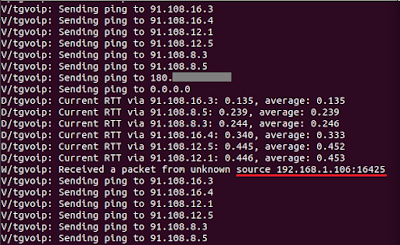 While user A access log will have public/private IP address of user B. Not only the MTProto Mobile Protocol fails here in covering the IP address, rather such information can also be used for OSINT. This issue was fixed in 1.3.17 beta and v1.4.0 which have an option of setting your "P2P to Nobody/My contacts", Later CVE-2018-17780 was assign to this vulnerability. 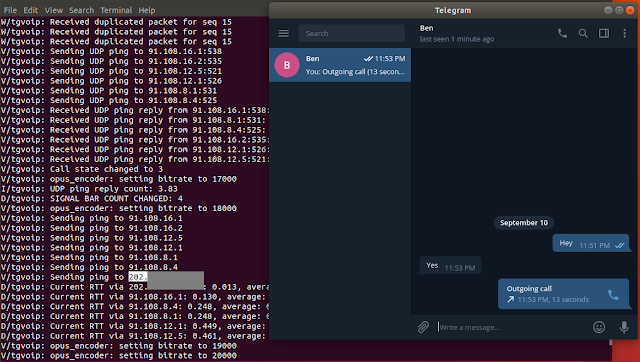 Summary: Telegram is supposedly is a secure messaging application but it uses SOCKS5 to transmit user credential's, neither traffic nor credentials are encrypted in the SOCKS5 protocol, but this is how the SOCKS protocol works (see https://tools.ietf.org/html/rfc1929), SOCKS5 carries passwords in cleartext. Telegram team is aware with this and says its working has intended. 3. Open "Proxy Settings" check "Use proxy"
6. Click share, the link gets copied. The link which gets generated have the password in plaintext, SOCKS5 is a transport protocol and by itself it is not encrypted. Requests transmitting such credentials in plain text are considered as a bad security practice. However, the URL which gets generated via telegram is in HTTPS but, URI producers should not provide a URI that contains a username or password that is intended to be secret. URIs are frequently displayed by browsers, stored in clear text bookmarks, and logged by user agent history and intermediary applications (proxies). Read this on oss sec-lists. Later CVE-2018-17613 was assigned to this issue. 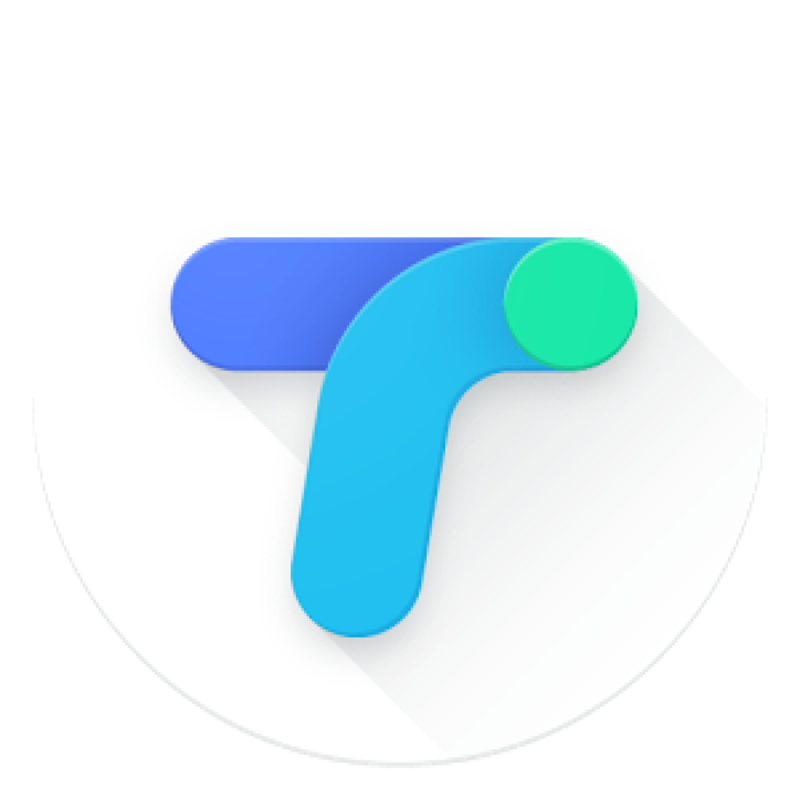 Summary: The Google Pay (Tez) apps leaks end users email address, this issue was marked as WONTFIX by google. You might be aware of different technique for extracting email from LinkedIn similarly Tez app allow you to do so. 4. 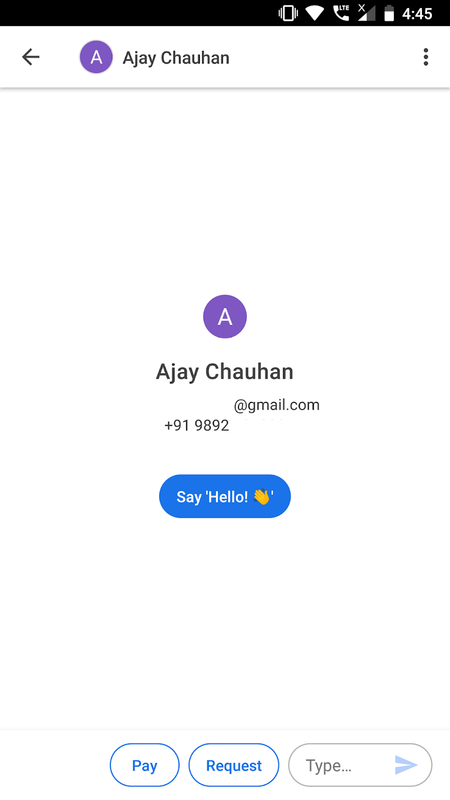 Click on any one contact. 5. Their respective email address will be displayed. 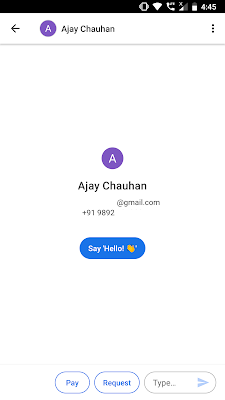 In this case, I have never had email of "Ajay" I just had his contact saved. However in the similar fashion, I can view email address of all the people in my contacts if they are on Tez. However it is not necessary to initiate the payment to get his/her email you can simply view it. (If user is already added in contact). This issue was submitted to google but was marked WONTFIX, google says "Thanks for report! We think the issue might not be severe enough for us to track it as a security bug." This is not such great bug but, such data can be use in OSINT to perform targeted attack on victim, hope you like the read. Summary: It was observed that the skype has a malloc(): memory corruption bug while you share some media/file with someone during a call. 4. The Skype gets crash. While on a call with one of my colleague, I tried sharing a file which froze my skype and then it gets crash. However moving further I tried to debug it with `gdb` and this is what i got. Cool, so when i read the backtrace, I understood that, this might be a memory corruption in `malloc()`. So basically, the memory allocator allocates pages of memory at once for use of programs, and it gives you a pointer within them. Since this files which i am trying to share may be larger for skype to handle during the call (PS: I was just sharing an jpg file in this case which was of 800kB). But for skype if a larger program is allocating larger amounts of memory and writing further past the end of your allocated space, then you'll end up attempting to write into unallocated memory and may cause a memory corruption. Okay, but I passed on this message to skype team on twitter, and they looked into this! At last, this was patched on Skype version 8.29.0.41 on Linux.